Its reported that during World War II Adolf Hitler’s intention was that, following the invasion, he would make the Royal Pavilion in Brighton his headquarters. William Joyce, an American born German radio propaganda broadcaster, named Lord Haw-Haw by British listeners, announced that “the Royal Pavilion Brighton was not to be bombed” for this very reason. Although the broadcast is probably correct, whether this was really Hitler’s intention is unlikely. Certainly if it was true he had not told his Luftwaffe Chief Hermann Goring and the German air crews! 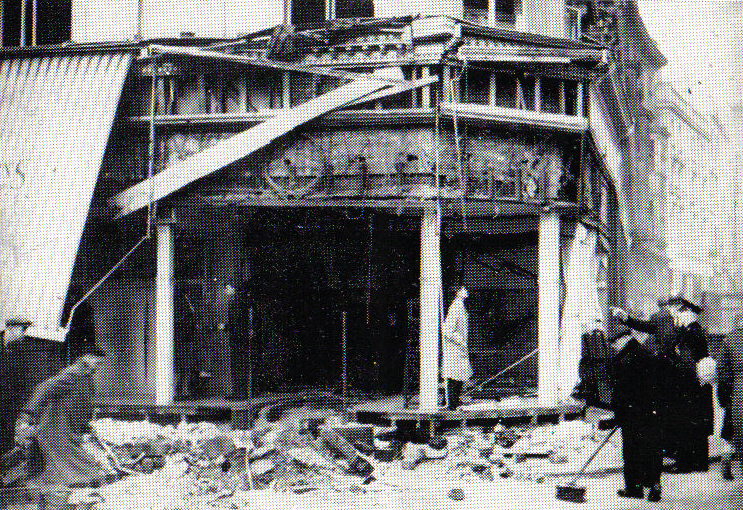 On the evening of 29th November 1940, two of the most recognisable and important historic buildings in Brighton were very nearly hit by a German bomb. That evening both the Royal Pavilion and the Dome came close to serious damage, if not total destruction! My father-in-law, Geoff Green, recalled the incident of that evening when Central Brighton suffered grave damage caused by 5 German bombs. 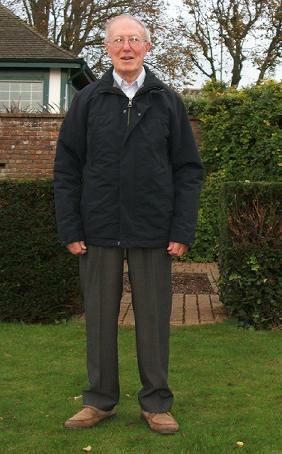 Geoff was 17 at the time and worked as a Junior Draftsman for James Couper Structural Engineers, in offices above Lloyds Bank, on the corner of North Street and Pavilion Buildings. The ground floor was the Lloyds Brighton Headquarters. Above Lloyds were the offices of Sun Life Assurance of Canada, and the 2nd floor was shared by accountants, Spain Bros & Dalling, and the James Couper offices. There was a works rota for Fire Watch, where they took turns to sleep on camp beds up on the roof so that they would be ready to deal with any incendiary bombs. Geoff was unaware of it on the evening in question as he was not on rooftop fire watch, however it was big news the following morning when he arrived for work! Damage in Kings Road and the south end of East Street was severe. Most badly damaged was the Lyon and Hall music shop, which was located on the junction of Kings Road and East Street, opposite The Savoy cinema. This was Brighton’s newest cinema at the time having opened 10 years earlier on the site of the old Brill’s Baths. Many people will know it as the ABC, the acronym of its owners: Associated British Cinemas. The 5 bombs were dropped in a straight line, in a north / south direction. The second bomb fell at the junction of East Street and North Street, just outside Hannington’s Departmental Store. 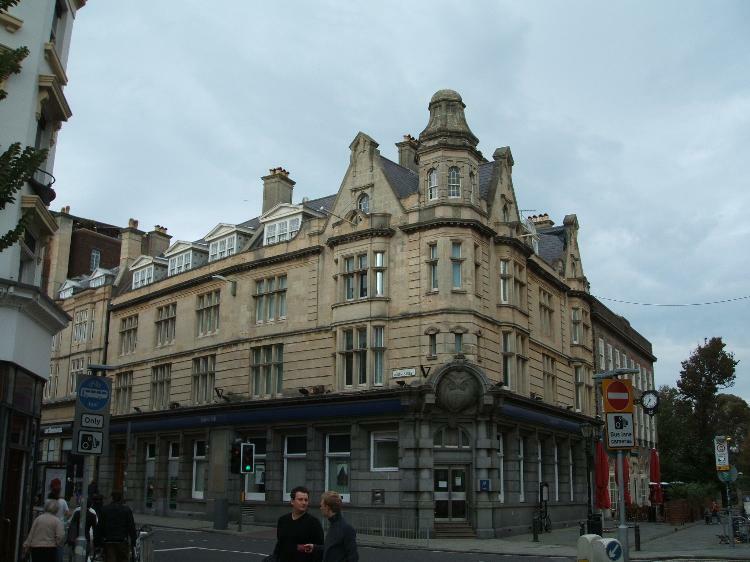 Hannington and Son was the biggest and most well established departmental store in Brighton, having opened in 1808. Again the damage in this area was severe as the bomb landed on the hard road. The shock waves went outwards, damaging surrounding buildings. Windows were blown out on most of the buildings at the Castle Square end of North Street, with glass and debris everywhere. Geoff arrived for work on the Saturday morning to find a scene of devastation. Most badly damaged was the glass fronted main entrance to Hannington’s. War work Geoff was doing at that time included the strengthening of certain types of air raid shelters in Sussex. It had been found that, due to an original design flaw, there was a possibility of the collapse of air raid shelter roofs due to shock waves if a shelter were to suffer a near miss. This important work had to continue, as well as building work for factories like Allen West & Co, who were engaged in the war effort. In his office all the windows had been blown in even though they had been taped to stop blast damage. Glass had blown across the office, through thick cardboard files and was embedded in the documents within. Bitumen felt was placed over the windows and mittens were the order of the day so that the draftsmen could continue their important work during the cold winter month of December. The third bomb fell in the Royal Pavilion Gardens, between the Pavilion and the Dome. Luckily, due to the very soft earth caused by autumn rain, the bomb buried itself deep in the soft ground before detonating. The shock waves of the explosion were absorbed below ground level, limiting damage to both the Pavilion and the Dome, but a deep crater was left in the soft mud between the 2 historic buildings. While there was a gap of two to three hundred yards between the first 3 bombs, the fourth and fifth bombs fell closer together behind Church Street, in the Jubilee Street area. This area is now home to the new Jubilee Library. Geoff can’t recall the exact location where they dropped. In 1940 this area was home to many small businesses, hidden behind the frontage of Brighton and Hove Gas Company and the Central Voluntary Primary School, both in Church Street. 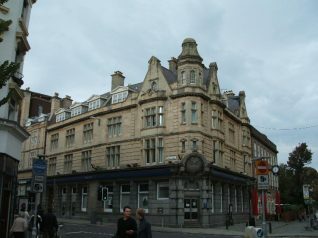 The Gas Showroom, although now disused, was more recently home to the Music Library. The Central School, facing New Road, was one of the oldest schools in Brighton, having opened in 1828, and it was controversially pulled down in 1967. Geoff can’t remember how much damage was done in this densely packed area, but it was probably significant. Is this the reason the site was derelict for decades? 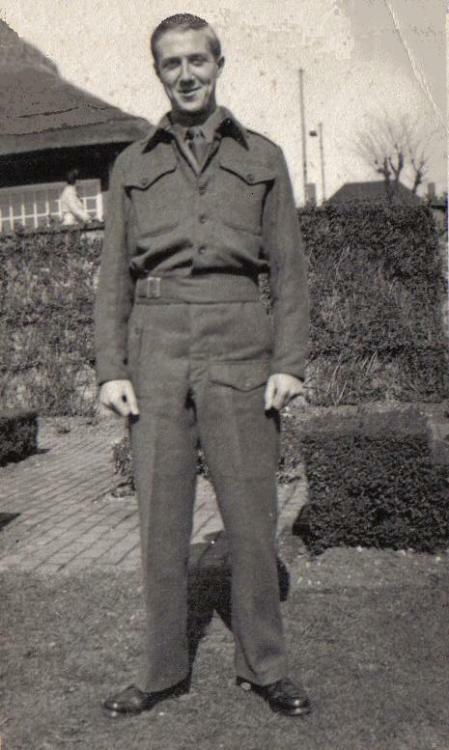 Geoff continued his studies until he passed his National Certificate and then he joined the Royal Engineers early in 1943. He was posted to CRE Scottish Command and then to DCRE at Dumbarton. He worked on various construction projects in Western Scotland to support the fighting army and was de-mobbed early in 1946, as his trade was urgently required to rebuild Britain. He went back to work for James Couper in the office above Lloyds Bank. Lord Haw-Haw was captured by the British and tried for treason although this was very controversial as he was an American. 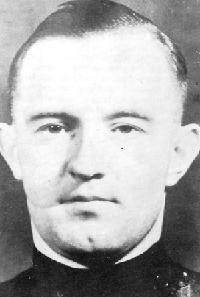 However he also held a British passport and this sealed his fate – he was found guilty and hanged on January 3, 1946. The roof above Lloyds Bank where Geoff did his fire watching is still there today as is, luckily, the Royal Pavilion! This is a fascinating story and one that I would love to hear more about. May I add a comment? There was more than one “Lord Haw Haw” broadcasting in English on Nazi wartime radio although William Joyce was probably the best known and the most notorious because of his sneering tone and his peculiar imitation of an upper class British accent. Certainly he was born in the USA but lived for some time in Ireland (where, ironically, he and his parents were fervent pro-unionists and he later claimed to have assisted the Black and Tans) and for this reason he is sometimes confused with James Joyce who died in Zurich in 1941. His charge of treason was based on the fact that he held a British passport which he had obtained by giving a false nationality. The prosecution claimed that, even though he held the passport illegally, he still owed a duty of loyalty to the King. On these grounds, he was found guilty of treason despite becoming a naturalised German in 1940 shortly after fleeing the UK. This is a facinating account of the raid that nearly accounted for the Pavilion. I have been interested in where the bombs fell on Brighton for some time, and have a modern A-Z map with hits superimposed. German planes raided Brighton on several occassions causing 96 civillian fatalities and many injured. It would, I am sure, be of interest to visitors to the site to be able to see the 1946 map ‘where the bombs fell’ in its entirety on the site. During the war years there was a large water tank placed on the lawn so that water could be drawn in case of fire. Also in 1948 in the middle of the western lawn there was a large barrage balloon that was floated aloft and lit up by searchlights (placed where the cafe is now). This was advertising for men to do there bit for Britain and join the Territorial Army. I had heard that the first of the WW2 bombs in Brighton was on 15h September, killing the parents of my parents’ good friend. I’m pretty sure that the first bombs to be dropped on Brighton were in the Kemp Town area, very early in the morning, 15th July 1940! David, the large water tank you mention above 5/12/07, was built into the deep crater left by the bomb that hit the western lawns of the Pavilion, I have a photo of it. The Lloyds Bank where you did your firewatching was where I started work after leaving school in 1944. I was still working there on VE Day and if you read my account of that day you will see that the staff were allowed to go over to East Street to hear Mr Churchill’s speech. Some years ago I gave Lloyds Bank an envelope which had a “Victory Bells” postmark.